Before stepping onstage, Eva Moolchan dances away in the crowd of a Bushwick venue on a Saturday night, as her DJ plays Princess Nokia’s “Tomboy” in the background. 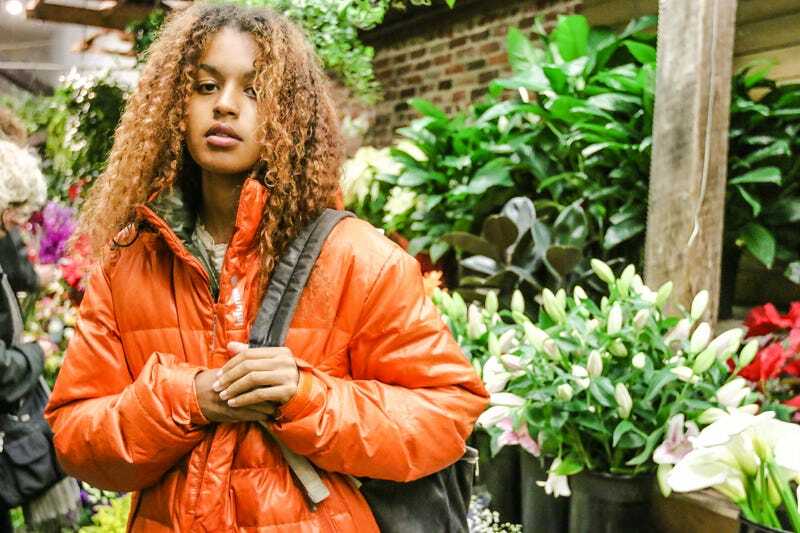 Wearing a neon orange down coat, Moolchan (better known as the one-person post-punk band Sneaks) darts amongst a crowd of 20-somethings, whose wardrobes only offer shades of black. “I’m learning to grow into letting go,” Moolchan says only a few minutes earlier at the bar. “I’m not so cautious of movement and not as cautious of things following over.” Still, watching the 21-year-old singer on and off the stage, you’d be hard-pressed to find signs of someone who’s still learning to let go. The night before, Moolchan wrapped up a cross-country tour with the Providence punk band Downtown Boys. “[Those] shows felt very different from the east coast,” says Moolchan. “This is my first time, so I don’t know if that is the south, but from our experience as Sneaks, it was definitely a different mindset.” And just as she wraps one tour up, she’s embarked on another journey: moving to New York. Onstage, Moolchan announces to the crowd, “I’m a new resident,” in honor of her same-day move to Brooklyn. Raised in Silver Springs, Maryland, Moolchan played in a numerous bands during her teenage years, including Young Trynas, but she eventually shifted her focus toward the solo project, Sneaks. And a solo project it is: As Sneaks, her music is solely her bass and drum machine. Most of her songs never make it beyond two minutes and move in tight start-and-stop fits. She’s cited the early-‘80s Athens, Georgia post-punk band Pylon as an influence, and you can hear it in her skeletal rhythms. Back in a 2015 interview with The Media Moolchan said: “When I’m writing songs, it’s actually pretty selfish, because it’s like, this is what I need to hear right now in my life. When you’re working with other people there’s a lot of compromising.” That particular musical approach can be heard throughout her (admittedly limited) discography. Her solo debut tape Sneaks was released on the D.C. label Sister Polygon Records, who’ve put out music from former tourmates Downtown Boys, similarly minded post-punk group Gauche, and the label owner themselves Priests. That initial tape was subsequently re-released as Gymnastics in 2015 on the French label Danger Records, then again on Merge Records last year. The latest edition added couple tracks to pad the album and it landed a gone-in-a-flash length of 14 minutes. Reduced down to just a bass and drum machine allows Moolchan’s music an immediacy that is mirrored in her sharp songcraft. Intros, outros, bridges, all of the extraneous parts of songs are eliminated to just get to the chorus and verse. And where contemporary post-punk infers a sense of morose and dread, Moolchan’s work—like her older song “Tough Luck”—is inviting with its spriness. “I’d like to release new music on a more frequent basis,” says Moolchan, who spent three years between her debut and her follow-up record It’s a Myth (which came out March 31 on Merge Records) “Not like, ‘Oh my god, a year,’ [but I’d] like less of a gap between [releases] and less of a middle man between me and my fans.” Cutting back the downtime between releases also makes sense, since It’s A Myth barely cracks a half-hour of total running time. Moolchan expressed that after SXSW she was inspired to write new material, but chuckled at her time trying to record on tour. “We tried to record in a car parking lot,” says Moolchan with a laugh. “We put the aux cord in a Mac computer and Dylan, our DJ for Sneaks, was playing Ableton out of the car speakers. If that’s recording, then yes.” Close enough, but it didn’t immediately result in new music. Still, It’s a Myth is an excellent record that continues to push along the sound of her original 2014 tape. The album still centers on her bass and a drum machine, but she added more surrealist touches to her lyrics. On “Not My Combination,” she interpolates a schoolyard rhyme about Tic-Tac-Toe with a Christmas carol (“I’m making a list and checking it twice”). Back onstage in Bushwick Moolchan throws off her coat and reveals a Limp Bizkit tour shirt. Not exactly the first band you would think of as she commands the stage, hopping on and off the bass throughout her half-hour set. When she steps away from the bass, her quasi-singing and rap style recalls true old school ‘70s hip-hop—more Get Down than Nas—when rhyming patterns were more stilted and fragmented before eventually refining into today’s modern rap. A fresh New York resident, Moolchan’s music also recalls the early ‘80s work of the New York band ESG that worked with similar ideas, but Sneaks never finds the same post-disco, pre-house grooves. Certainly not planned, but Sneaks music fits squarely in the history of where she now calls home. Fresh off a tour and in her new city, Moolchan is ready to hit the road again and reach out to her fans. Rattling through ideas about her live performance, Moolchan says “I don’t want to be singing to the wall,” concerned about connecting with the audience. But for her that won’t be a problem.